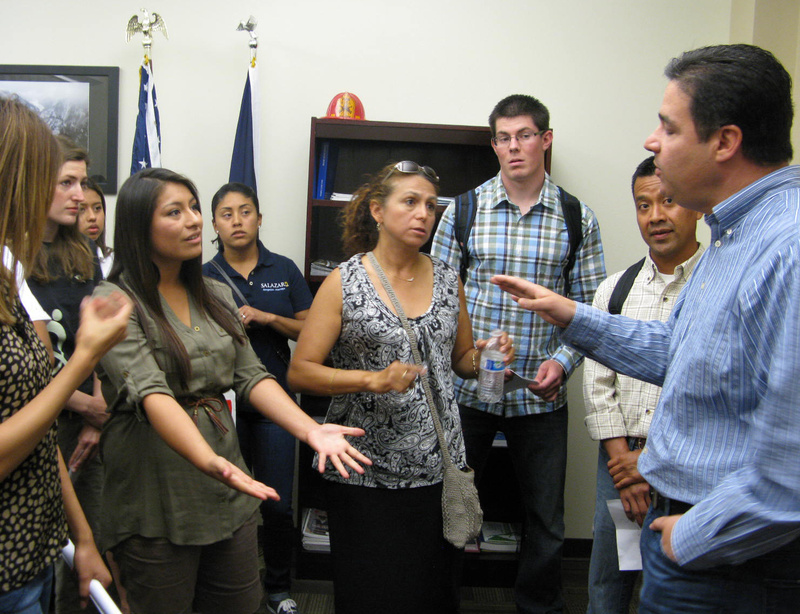 MERIDIAN, Idaho – Idaho’s U.S. Rep. Raul Labrador pledged Monday to keep working on immigration reform, despite having walked away last week from a bipartisan group working to write a House bill. “I promise you, this does not delay the process,” he told a dozen members of the Coalition for Immigrant Rights of Idaho who stood chanting in the foyer of his office for nearly 40 minutes before Labrador emerged from a conference call. Labrador then talked with the group, answering questions in both Spanish and English for the next 45 minutes, in a conversation that was sometimes friendly but occasionally heated. “My goal is to have immigration reform done by the end of this year,” Labrador said. Labrador, a conservative Republican of Puerto Rican heritage, has been viewed as a potential key player on immigration reform and was part of an equally split group of four Republicans and four Democrats working on House legislation. He said Monday his differences with the bipartisan “Group of Eight” went beyond the health care issue he pointed to last week: He believes immigrants should cover their own catastrophic health care costs rather than qualify for coverage under the national health care reform law. Labrador said he’d earlier “agreed to disagree” with the group over guest-worker programs, and the health care issue was the second big disagreement. At that point, he said, he saw what had been overall agreement on a broad array of issues disintegrating as the lawmakers delved into the details. Most importantly, he said, he became convinced the bipartisan group was working toward a bill that wouldn’t pass the GOP-dominated House. The reform activists said they were disappointed Labrador walked away from the bipartisan talks and that they thought it could set back the movement toward immigration reform.